Zack may seem helpful but that's because this is a photograph and not a video. 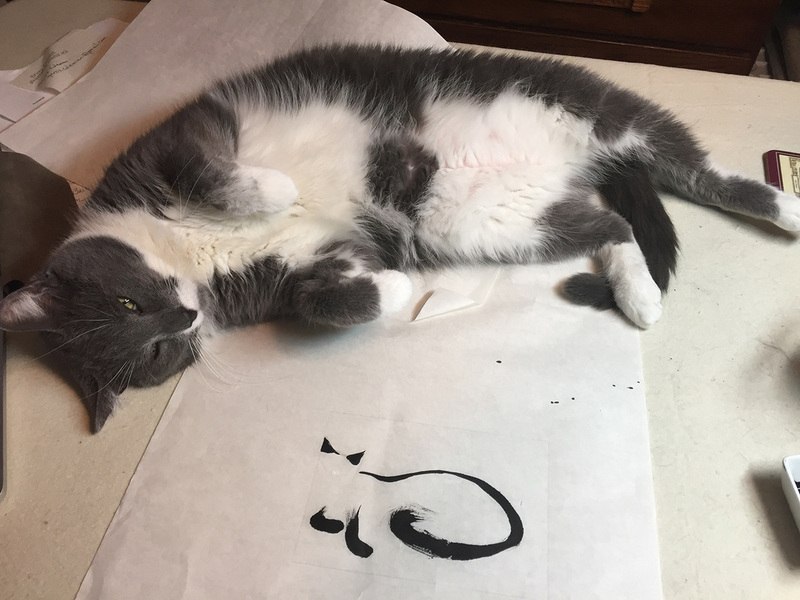 One minute later he was sliding his foot toward the still-wet ink. Did he think there was another cat threatening his empire? If so, I'll take it as a compliment. The small painting that Zack is contemplating is one of a series of Essential Cats which began with a challenge to myself: how few strokes of the brush will suffice to create a cat ... what is the essence of cattitude? As is often said about human portraits, the life is in the eyes ... but for cats I've found it's also in the tail ... and sometimes even whiskers can tell a story. Sometimes simplicity is far from simple to achieve. 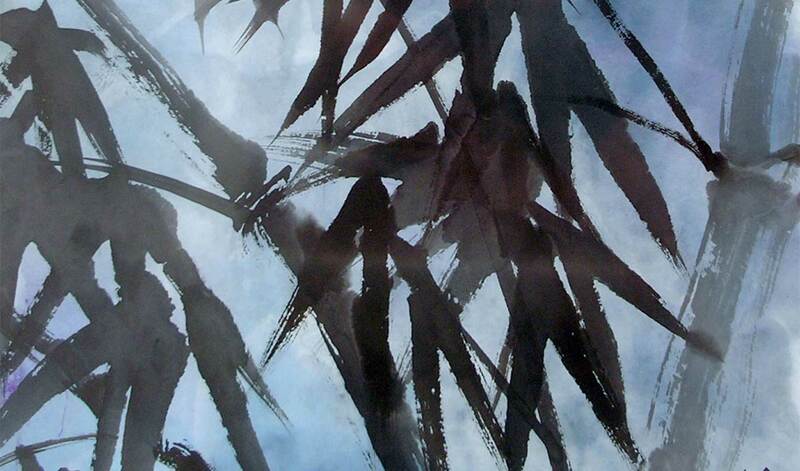 A perfect bamboo leaf, painted in seconds at the end of an impossibly thin stem, is the result of many thousands of bamboo leaves painted before it. The sweep of the brush, the pressure on the paper, the loading of ink become body memories; to me that’s the real meaning of the Asian brush painter’s saying that we take in the world with our breath and let it flow through us, breath to arm to hand to brush, and out onto the paper. And there is such joy to see that perfect bamboo leaf appear. When I teach, I tell my students to “land a plane and take off again” when they practice a leaf. The tip of the brush goes down, down, and gently touches … it glides, heavier and heavier, on the paper, and then swoops skyward again. And joy expands when the student feels it too.